New information from the latest Weekly Famitsu. 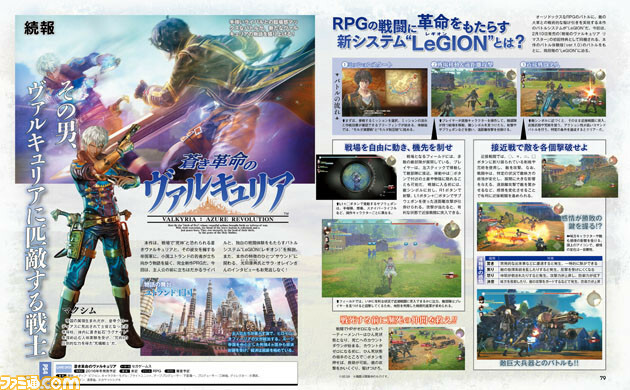 The latest issue of Weekly Famitsu reveals a new character set to appear in Sega and Media Vision’s upcoming PlayStation 4 RPG Valkyria: Azure Revolution. Maxim is an enemy character that will stand before the protagonists. Additionally, the magazine has an outline of the battle system included with the “Battle Demo Ver. 1.0” of Valkyria: Azure Revolution bundled with first-print copies of Valkyria Chronicles Remaster. Famitsu also has an interview with Yasunori Mitsuda, who is in charge of the game’s music, and Sarah Alainn, who sings the “Song of Death” sung by the Valkyria. Valkyria: Azure Revolution is due out for PlayStation 4 in Japan this winter. Update 9:40 a.m.: New details have arrived. He was born in Empire territory, but was selected as a military officer by Emperor Claudius and became a young soldier. Ragnite was placed inside his body as a human experiment, so he is able to use Magic Arts of overwhelming power and is thus a Magic Arts soldier. Weekly Famitsu has details on the LeGION battle system of the “Battle Demo Ver. 1.0” of Valkyria: Azure Revolution included with first-print copies of Valkyria Chronicles Remaster. 2. Battlefield Movement and Long-Distance Attacks – Players control characters through direct movement. You can fire at enemy symbols and use sub-weapons for long distance attacks. During movement, you can press the Circle button to hide behind nearby sandbags and cover. You can fire with R1, or use your sub-weapon for a long-distance attack with L1 and Square. If your attack is successful, you’ll be in a better state when you get to close combat. 3. Close Combat – In close combat, you’ll attack enemies through four buttons assigned to your weapons and Magic Arts. During battle, the reactions of allies and enemies change based on specific situations and have a big influence on the battle’s development. If you surprise an enemy with a long-distance attack, or something along those lines, their reactions could change, giving you an advantage. If a party member’s HP reaches zero in battle, he or she will be in a near-death state, and a countdown timer to death will begin. You’ll need to get to your ally and heal them before their countdown timer reaches zero for them to survive. Otherwise they’ll die. You can’t revive an ally who’s died. The background music will seamlessly change between fields and battle. The demo might be available day and date with the release of Valkyria Chronicles Remaster on February 10.